Color your eggs while they are being boiled. Kids will have great fun, when they are served boiled eggs that are colored. Just scroll down and learn the technique. This is really going to add color to your Easter breakfast. Know for sure, that your family and folks will be relishing on it from the core of their heart. 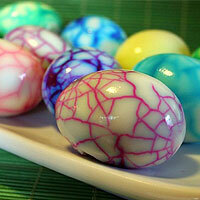 Add home made coloring to the water when boiling eggs for breakfast. You can have yellow, red and green coming handy out of your own kitchen. Or they can be had from any grocer in concentrated form. Well, you can always use other colors for a better effect. But, please make sure they are edible. Use a small pan to boil the eggs. Boil at most four eggs at a time for a better result. Otherwise the color will not be concentrated enough to tint the eggs. Allow them to be cooled. And serve them in a basket for a special Easter first course. Use a pastry bag filled with white cream to design the shell-tops. Just squeeze out to put some small drops of beads on the portion of the eggs facing up. And make sure that the cream beads don't get messed up by coming in contact with other eggs. You may serve bowls of mayonnaise and pesto so that everyone can shell their own eggs and coat them with mayonnaise.